Are you as mystified by the variety of labels out there today? What they do and do NOT mean? The Food Industry’s desire to make the labeling system more user friendly, has gotten more complicated than ever to most consumers. Here’s a little help decoding the mystery of the labels on meats sold in the USA to start. Animal Welfare Approved: No antibiotics are used for growth promotion or disease prevention. Sick animals can be treated with antibiotics. Animal welfare and hygiene practices are fully addressed. Certified Humane: No antibiotics are used for growth promotion or disease prevention. Some animal welfare and hygiene practices are addressed. Gap Steps 1-5+: (i.e.sold at Whole Foods) No antibiotics are used. Animal welfare and hygiene practices are addressed to varying degrees (sometimes?). No Antibiotics/Raised without Antibiotics: Antibiotics are not used for ANY purpose. The labels accompanied by the USDA Process Verified shield are more reliable. Organic: Animals cannot be given antibiotics. Sick animals treated with antibiotics can’t be labeled organic. The exception is chickens: They can be given antibiotics in the egg or on the day they hatch but no afterwards. American Humane Association: Neither animal nor human antibiotics are used for growth promotion, but both may be used for disease prevention. Some animal welfare and hygiene practices are addressed. Grassfed: Not all grass-fed beef is raised without routine antibiotics. Look for a no-antibiotic or organic label as well. The American Grassfed Association seal means no antibiotics, and the claim is verified. Natural/All Natural: This label is not related to antibiotic, hormone, or other drugs administration or how the animal was raised. “Natural” on meat and poultry only means that it contains no artificial ingredients or added color and is minimally processed. NO Hormones: Simply put, this means no hormones administered. It doesn’t mean no antibiotics or other growth promotants. By law hormones cannot be used in poultry or hogs, so packages of meat from those animals with this claim are no different from those without it. All clear now? Not really, right? Since new labels are popping up all over the place (some only marketing to make their product look more inviting) it is best to re-read those above. Then make a decision about what are the best quality products that fit into your budget and are the best for your family. Once that is decided, you will know what to look for in the store every time you grocery shop. Atleast, for now. I have been enjoying this protein shake all week and I just had to share it. If you are craving a latte, you MUST try this. Not only will it fit the bill, but it will keep you fuller longer and out of the grasp of a sugar crash later. Why cottage cheese you ask? It is full of B Vitamins for energy:1/2 cup packs 12% of your daily dose. Blend all ingredients until smooth. Enjoy. Try it, and let me know what you think via comments. Are all protein portion sizes the same? How do I know if I am getting enough protein if I am vegan? Protein is a foreign word to me, help? Trails Recreation Center, Aurora, CO. Forget the diet, LIVE healthy! “Food for thought” on this Thursday afternoon. Have you looked at the labels of what you eat on a regular basis? Don’t go for a diet but rather a lifestyle of eating to make the changes you want to see in your body, whether that be healing, shaping, or just feeling the best you can feel. You don’t have to spend hours dreaming of food in a hunger haze. You don’t have to load up your grocery cart with only one kind of protein, carb, or fat. You have to get back to eating what your body knows how to digest. It’s very personal but very attainable! 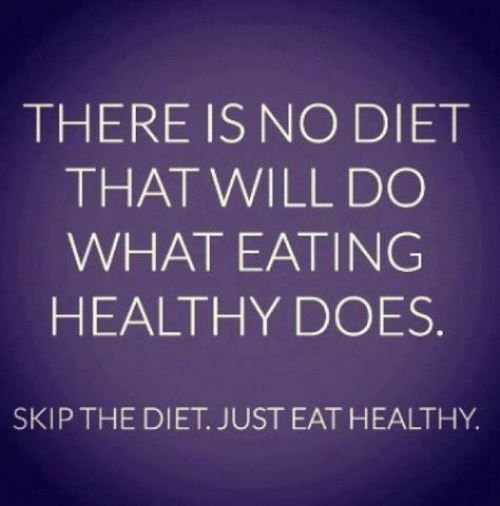 Skip the diet!